A wise proverb. Maybe not one that immediately comes to mind when you think about health insurance. But if you are an owner of a practice, teaming up with a knowledgeable partner could help you go a long way toward the goal of controlling your health insurance costs. As an owner in a practice you need to budget your time and resources very carefully. But trying to keep up with the complex changes in today’s health insurance marketplace can be confusing, not to mention time consuming. Your job is to help patients get well. Our job is to support you with the information and guidance you need to choose quality health insurance that works for your budget. We’ve partnered with Texas physicians for decades, sharing research, analyzing and comparing policy information – which we do at no cost or obligation. As part of our research, we uncovered two little-known waivers to regulations in the Affordable Care Act (ACA). These waivers are important because they could give you access to health insurance options you might not have known were available to you. Specifically, they may help you qualify for high quality, ACA compliant group PPO health insurance. One waiver impacts how much you might spend on employee premiums. With this waiver you would not be required to pay 50% of your employees’ premiums – as is typically required under the ACA. You could contribute as much or as little as you want. The second waiver relates to how many employees are needed to participate in a group plan. With this waiver you would not need 75% of your employees to participate – as currently required. There would be no minimum number of employees required to participate. This means you could be eligible for a group PPO plan for yourself alone. Group PPO health insurance could be a way to lower costs and see a wider range of benefits than with an individual HMO. To be eligible for the waivers, you must have a tax I.D. number and one full-time employee. You should also know that you must sign up for the waivers before the end of the group special enrollment period – December 14th, 2018. 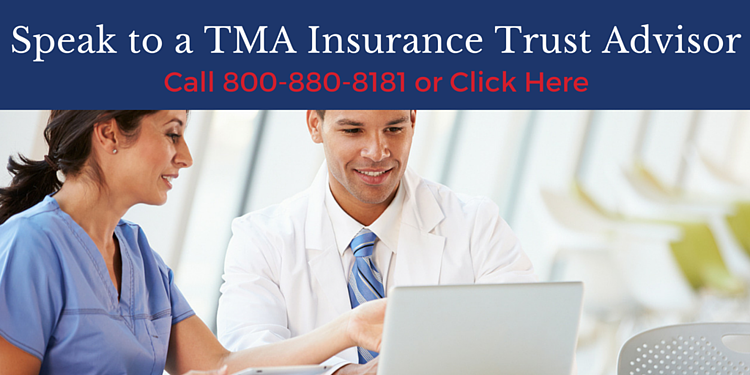 A TMA Insurance Trust advisor can provide additional details and further explain the waivers. We are here to take the hassles out of shopping for health insurance and to help you find the plan that works best for you or your practice. Trying to establish more control over your health insurance costs in this changing environment may seem challenging. But working with the right partner can make it easier and more productive. We invite you to contact us now to begin a discussion to ensure that you have the coverage you want in place by January 1st.